AFTERNOON TEA WITH CADS: Celebrating the geometric forms of the Art Deco movement and its influence on modern design. David Jameson- Author of "Alfonso Ianelli, Modern by Design" and the upcoming "Everyday Modern: The Industrial Design of Alfonso Ianelli"
David Nitecki- Architect at Alexander & Associates, Ltd. The panelists will discuss the impact and preservation of the Art Deco movement and its resurgence in 21st century design and architecture. ROHL will also introduce the new ROHL Perrin & Rowe® Deco Bath Collection, which is inspired by London Art Deco design of the 1920s. Hosted by LuxeHome and the Design Center, Design Chicago is a two-day event featuring 120 showrooms and 2500 brands debuting the newest products and hottest trends in the historic Chicago Merchandise Mart. 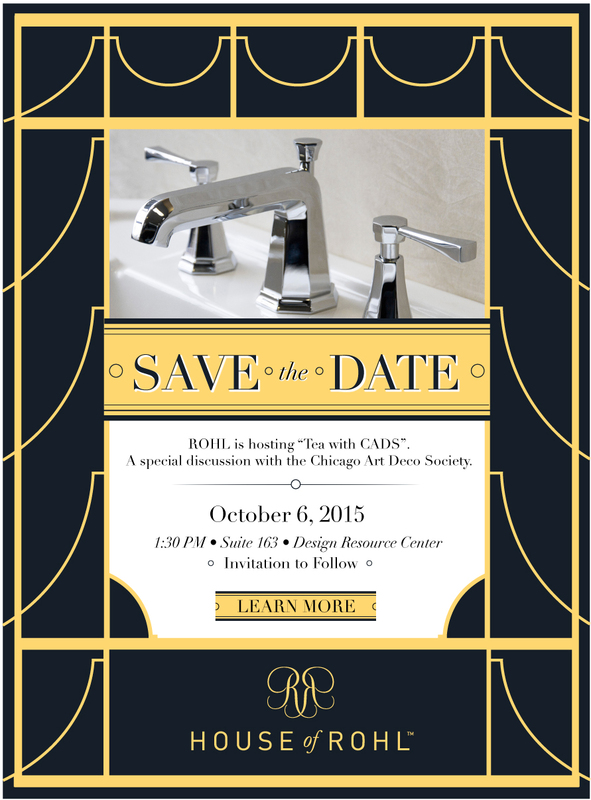 To RSVP for Design Chicago and join ROHL for this premiere design event, register HERE. For more information, see link HERE.